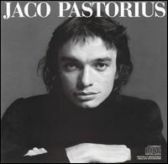 It's impossible to hear Jaco Pastorious' debut album today as it sounded when it was first released in 1976. The opening track — his transcription for fretless electric bass of the bebop standard "Donna Lee" — was a manifesto of virtuosity; the next track, the funk-soul celebration "Come On, Come Over" was a poke in the eye to jazz snobs and a love letter to the R&B greats of the previous decade (two of whom, Sam & Dave, sing on that track); "Continuum" was a spacey, chorus-drenched look forward to the years he was about to spend playing with Weather Report. The program continues like that for three-quarters of an hour, each track heading off in a different direction — each one a masterpiece that would have been a proud achievement for any musician. What made Jaco so exceptional was that he was responsible for all of them, and this was his debut album. Beyond his phenomenal bass technique and his surprisingly mature compositional chops (he was 24 when this album was released), there was the breathtaking audacity of his arrangements: "Okonkole Y Trompa" is scored for electric bass, French horn, and percussion, and "Speak Like a Child," which Pastorious composed in collaboration with pianist Herbie Hancock, features a string arrangement by Pastorious that merits serious attention in its own right. For a man with this sort of kaleidoscopic creativity to remain sane was perhaps too much to ask; his gradual descent into madness and eventual tragic death are now a familiar story, one which makes the bright promise of this glorious debut album all the more bittersweet. (This remastered reissue adds two tracks to the original program: alternate takes of "(Used to Be a) Cha Cha" and "6/4 Jam").